One of the best things about taking your pet on holiday with you is that it’s a great excuse to get the family out and about and exploring on foot. Northumberland National Park’s always a good starting point for that family walk, and it’s gorgeous. The park’s home to Hadrian’s Wall UNESCO World Heritage Site, and it’s one of those landscapes that you’ll remember for a lifetime. If you fancy heading off the beaten track a little for your Northumberland walks, the Cheviot Hills have the feel of being miles from the hustle and bustle. Found on the Anglo-Scottish border, the hills were formed from cooling lava millions of years ago, and if you’re feeling energetic, you can climb the Cheviot – the highest point in Northumberland. We know how it is…you get halfway through a bracing family walk and suddenly all the whole clan can think about is food. So, it’s good news that there are pet friendly places to eat and drink across Northumberland. Half the fun’s finding your own favourites, but we’ve dug out a few popular choices to get you started. If you find yourselves taking the sea air in the coastal town of Amble, Castaway Café on the pier welcomes pets, and it’s a pretty spot to huddle up with a hot chocolate and enjoy the views out to sea. For that lazy afternoon in a village pub (pretty much a must while you’re in Northumberland), The Craster Arms offers a warm welcome to pets and their owners, and it’s known for serving up good food to boot. If you make your way to medieval Warkworth to see its famous castle, The Masons Arms is dog friendly, and dogs are also welcome in the beer garden. There’s one pet friendly Northumberland day out that overshadows all others, and that’s Hadrian’s Wall. 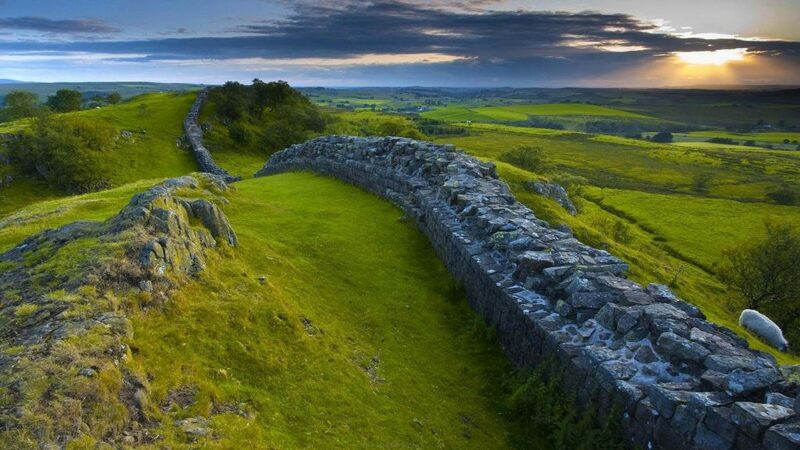 Included in The Guardian’s hot list of places to visit in 2017, the wall stretches for 84 breathtaking miles, and the Hadrian’s Wall National Trail means you can wander as much of the monument’s route as you can. 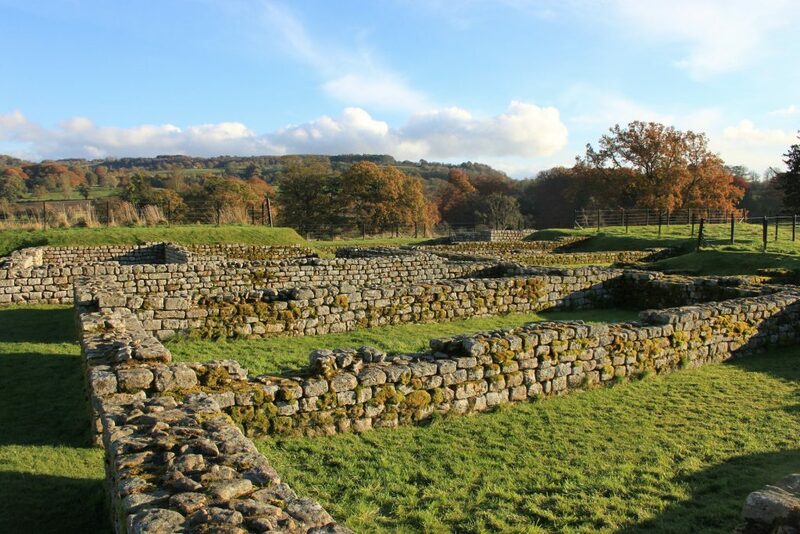 If you’re taking the kids, the story behind the wall’s a great way to bring Northumberland’s past to life, and it’ll be a walk with the dog you never forget. With so much history to its name, it’s no surprise that some of the best Northumberland days out (with the dog of course) take in landmarks and ruins. Dogs are welcome to Chesters Roman Fort and Museum in Hexham (a Roman fort on Hadrian’s Wall, built to protect the border), and at Dunstanburgh Castle too. 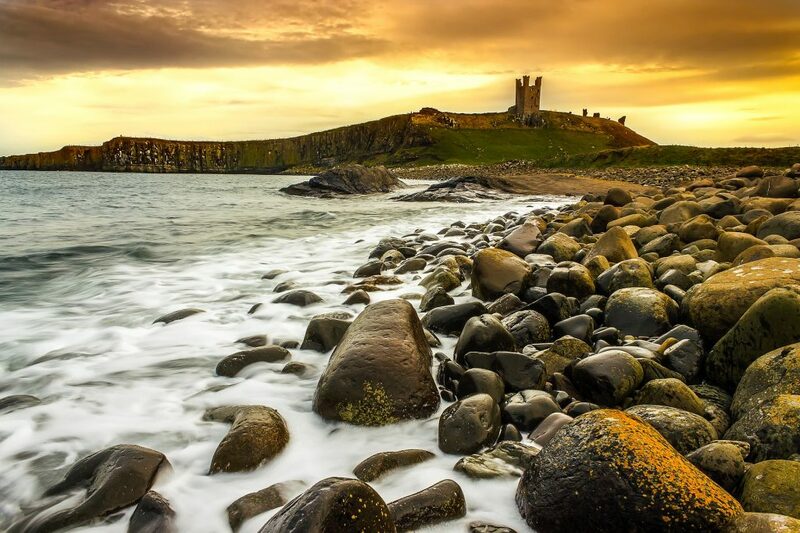 The castle ruin sits on the county’s coastline, and it’s beautiful. Some of the best-loved beaches in Northumberland are pet friendly, and that means you can put a day aside that’s all about sniffing rock pools and running up and down the shore. Dogs are welcome on the beach at Berwick-upon-Tweed, and it leads to the coastal path so it’s a great starting point for a walk when you’ve finished on the sand. The ever-popular Fishermans Haven Beach and Cresswell Beach are also pet friendly, so make sure you pack that bucket and spade.